A litte late with the review, just didn't have the time to review the log and things. I didn't spend all the time at contesting. It actually was less then expected. Therefore I probabely missed some nice openings on 15m. The weather was great and there were some chores that had to be done. My little girl already asked if I would build the trampoline again for her and so it had be done. After that I had to play with her of course, a lot of fun. 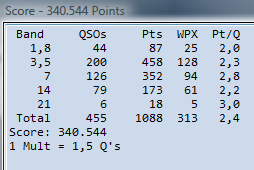 I really don't know how on earth I managed to make 455 QSOs after all and reasonable DX as well last weekend. I attended a rock concert at friday and was back home at 01:30 local time in the morning. 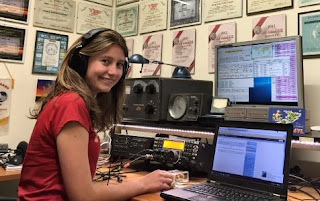 Up 06:30 local time (5:30 UTC) and started with the contest. 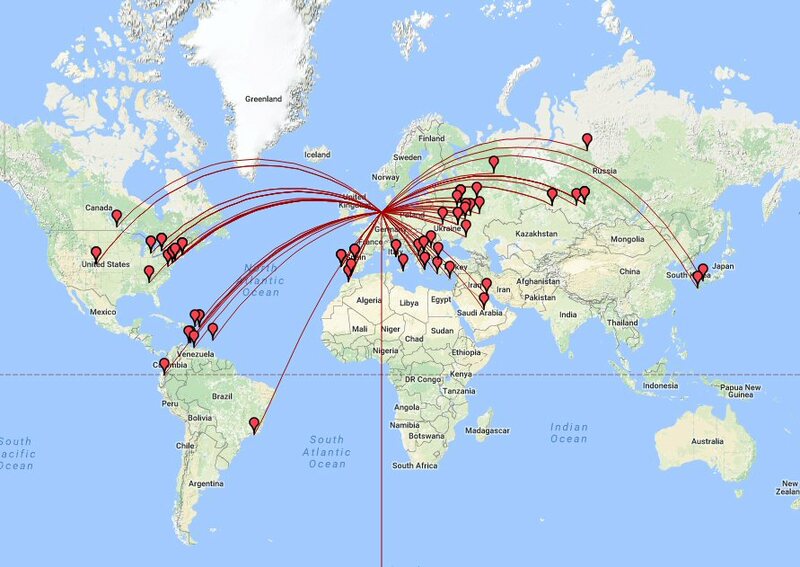 Propagation was great on 160/80/40. 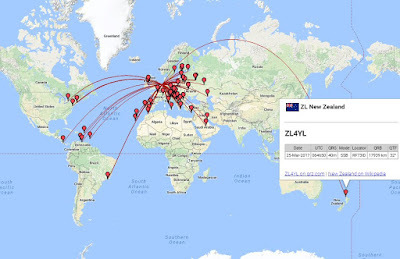 I managed a New Zealand QSO on 40m with ZL4YL Xenia, absolutely my best DX this weekend. She made many operators happy, although she was very very weak her high voice was cutting through like a knife making many QSOs to Europe. I heard her on Sunday morning as well. Unfortenately I never heard a whisper from S21 or E51 not even on other (WARC) bands as well. 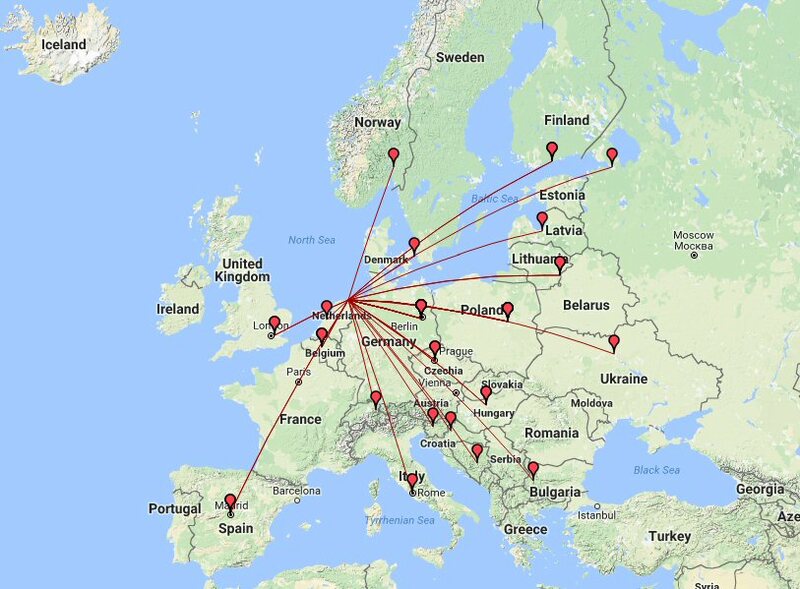 So, no ATNO this weekend...however I made some nice DX even on a almost dead 15m band. 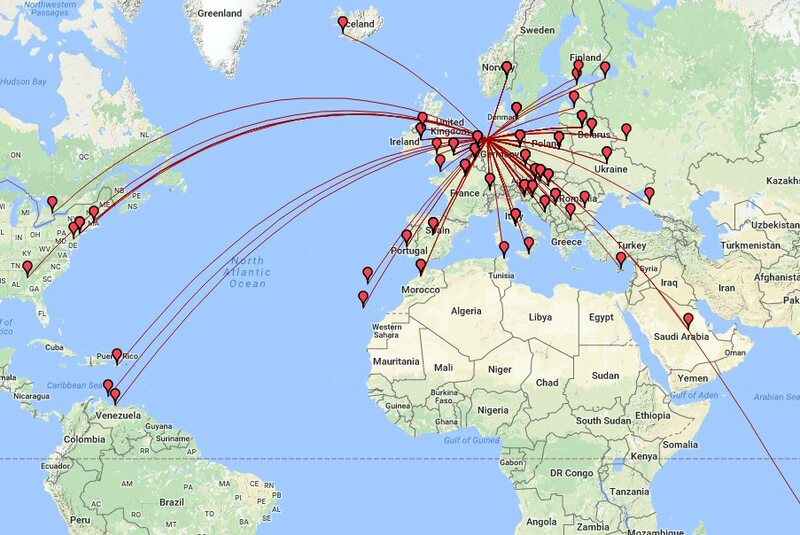 The propagation on 20m, 15m and 10m was on and off. Like bursts. The only station I heard on 10m the whole weekend was 9A1A but I was not able to make any QSO there. When I tuned over the 20m band Saturday evening it was already completely dead very soon after sunset. But later on around 22:30 UTC it came to life again when I heard and worked several USA and Canadian stations. 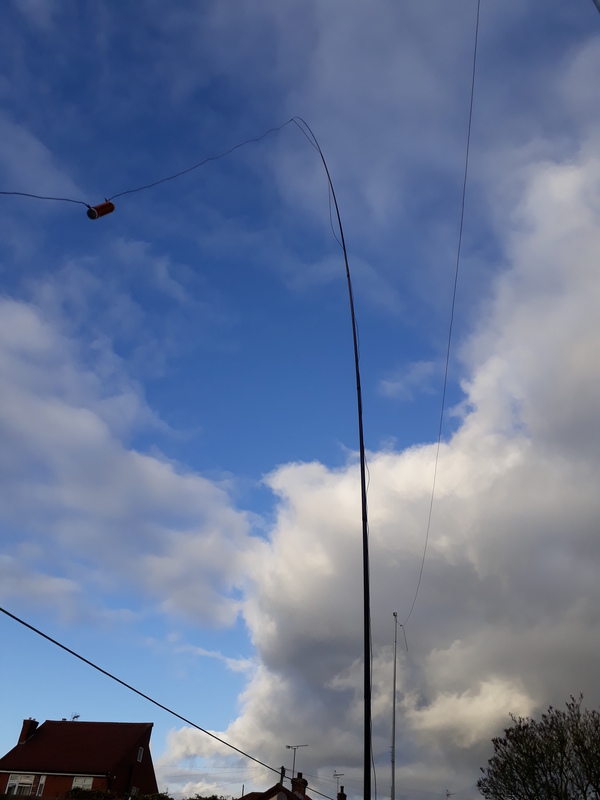 It was difficult to get into the shack at daylight but when I sometimes did for 5 or 10 minutes I luckely worked some DX. Sometimes the DX station was the only one on the band strange enough, like there was a pipeline between us. I noticed many strong stations were S9 at one moment and 5 minutes later they were covered by noise and signals were decreasing very fast. The low bands were much better, I even heard a few stations from the USA on 160m SSB although I was not able to get my tiny signal through and make a QSO. 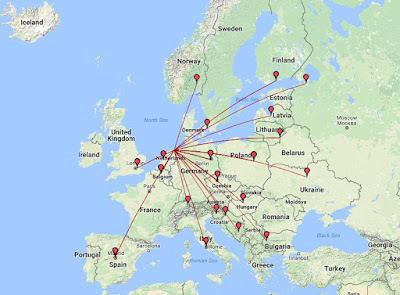 I noticed A lot of stations from the USA now between 3,6-3,7 MHz, they suddenly discovered this part of the 80m band? Or is it a change in restrictions? 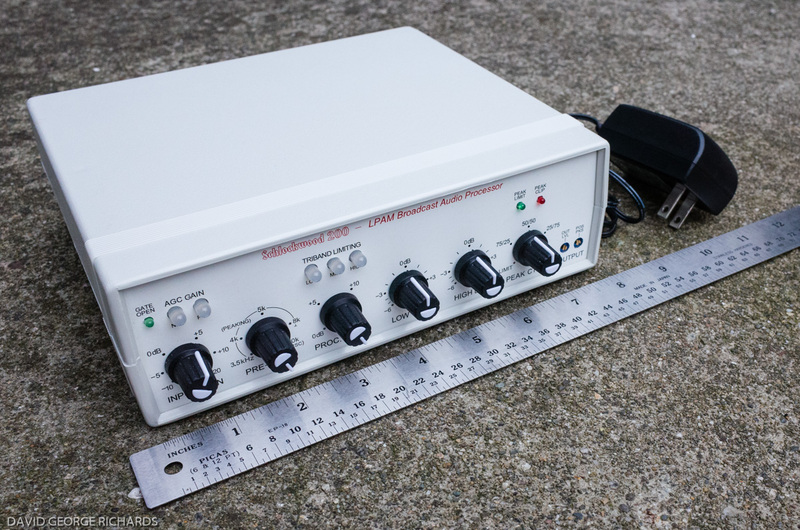 In the years past I always worked USA split were they transmit above 3,8 MHz and listen between 3,6-3,7 MHz. Propagations were indeed great sunday morning as most of the USA stations were S9 here on 80m. Last contacts were made on 80m sunday night, I struggled to get to 400 when suddenly I was spotted by good friend PB7Z, followed by a huge pile-up getting my 72 QSO extra in the log that hour. Tnx Bernard! 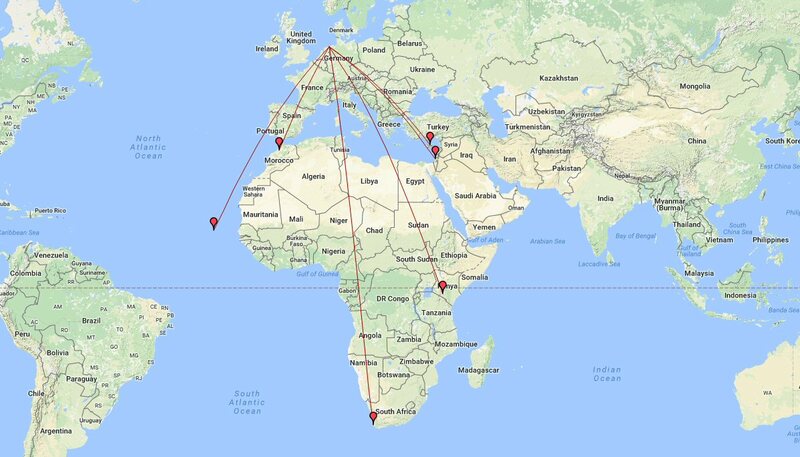 15m only propagation tp the south and especially Africa. Daylight propagation when I had not much time playing radio. 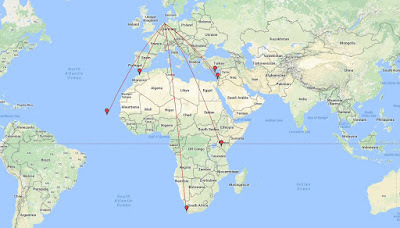 Last year I did the 100 DXCC QRP within 100 days challenge. 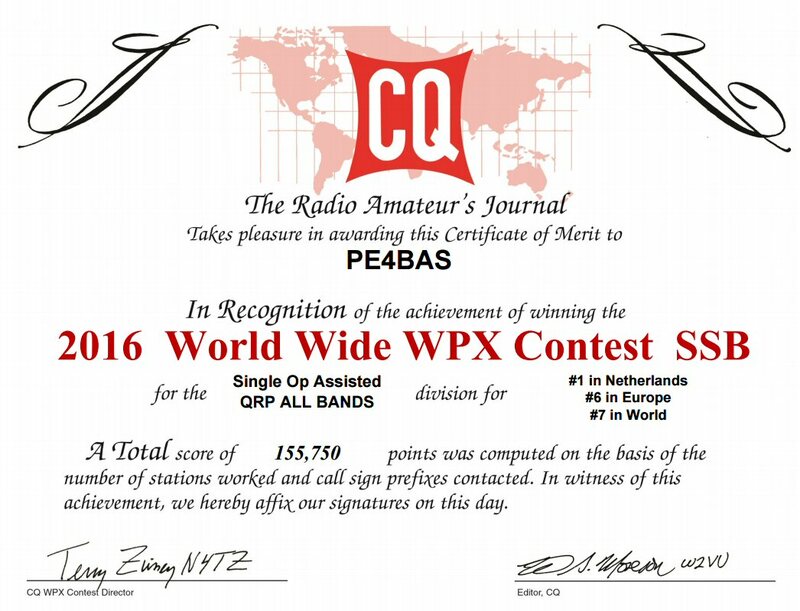 I was in this contest with QRP, only 5W from my Yaesu FT-817. 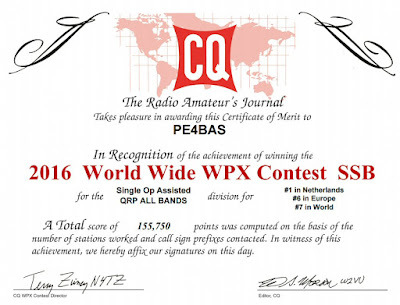 After I submitted my log at the CQWW WPX site I obtained my certificate for last year and discovered I was number one in the Netherlands ;-) Happy with the result! Toch nog een leuk aantal, meer dan mij in ieder geval, ben op 427 geëindigd. Hier ook niet gezocht voor dx trouwens. #cqww WPX SSB 2017 what's interesting?